On the Anniversary of Mohamed Haji Ibrahim Egal’s untimely death 16 years ago, we present a brief analysis of his legacy. The aim of this article is to show how the selfish policies of the Somali Republic found it expedient to pursue without regard to the interests of the Somali people in NFD. 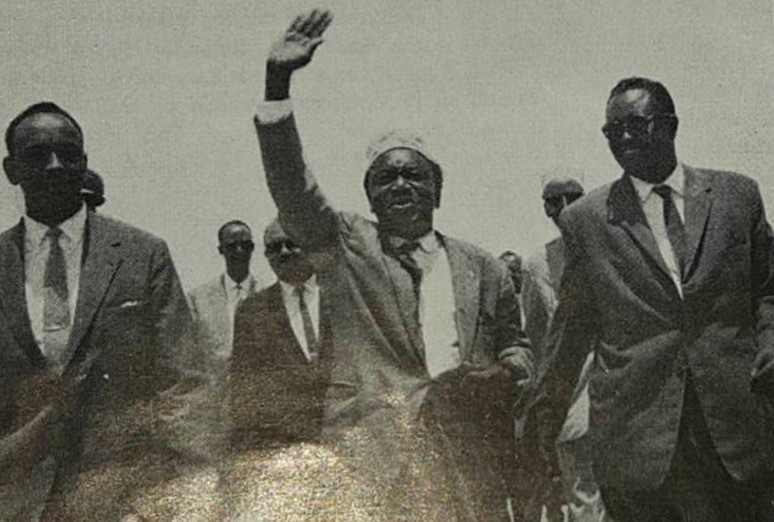 In the summer of 1962 (July 26, 1962), Mr. Jome Kenyatta, president of the Kenya Africa National Union (KANU) and Mr. Ngela, president of the Kenya African Democratic Union (KADU) paid an official visit to the government of the Somali Republic. Mr. Kenyatta and the KANU delegation visited only Mogadishu, but Mr. Ngela and his KADU delegation were to see during their seven-day visit both Hargeisa and the port of Kismayo. Mohamed Ibrahim Egal who was familiar to the politics and history of Jome Kenyatta took a big role in welcoming him to the country. Egal who was the Prime Minister of the Independent British Somaliland was relegated to a Ministerial job, namely the Minister of Education, which was an interior position at the time, nevertheless, Egal took a leading role in welcoming Jome Kenyatta. 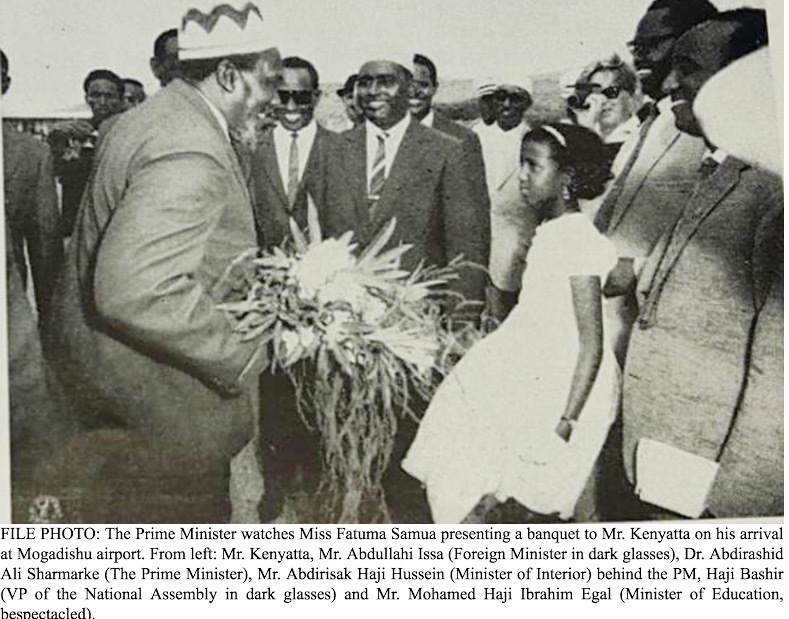 On July 27, 1962, at the Cinema Hamer in Mogadishu, Mr. Kenyatta was eloquently introduced the Minister of Education, Mr. Mohamed Ibrahim Egal. In a tribute to Mr. Kenyatta’s contribution to Pan Africanism and the Liberation of Africa, the minister said that historians are unanimous in one verdict it is that this man is made of more than the common fiber of the ordinary man that he rises in power over the ordinary span of his fellow men. “He and his small band of brothers have set their tremendous intellectual resources to the creation of an African personality. They have taken the philosophy of great black American, Dr. Garrey, and like the poet have given it a form and local habitation, a form in the context of principles of Pan-Africanism which every African today urgently and affectionately embraces, and a local habitation in the deep recess of every African Heart”. In his reply, Mr. Kenyatta reminded the modern generation of the gallant freedom fighters of the thirties. “I would like to take this opportunity to salute the gallant freedom fighters who started the concept of Pan-Africanism in difficult conditions, namely the Inte Goerge Padmore, Dubios, Kwame Nakrumah, Azikiwe, Peter Abrahams and others. In these days in our little meetings as exiles in Manchester, London or Paris, we dreamed of an Africa that free and united, an Africa that would no longer have its destines decided in the capitals of Europe but an Africa that would have a distinctive personality with a mind and will of her own in international politics. 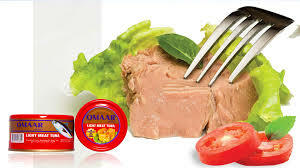 We had visions that through this concept we would recreate a new a vigorous Africa”. It was during this visit by Mr. Kenyatta to Mogadishu that Egal realized that the dream of “Greater of Somalia” was dead. 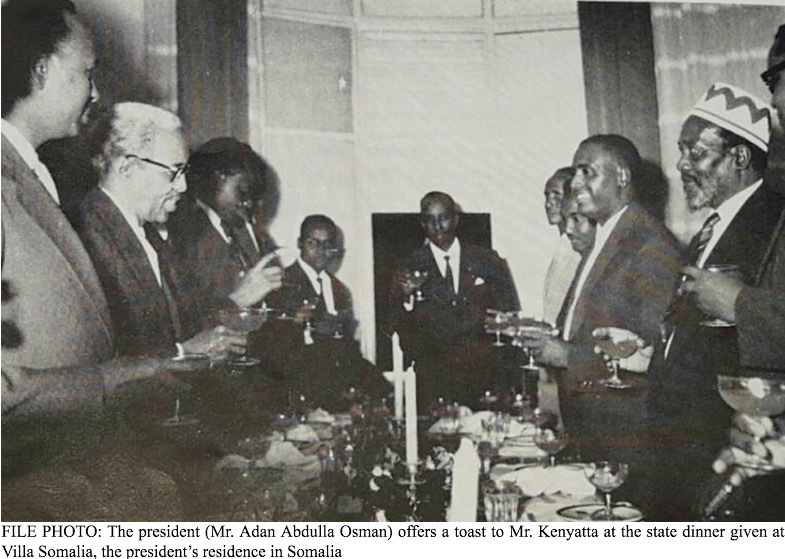 The Somali Prime Minister, Abdirashid Ali Shermarke, said in a speech on July 30, 1962 at the end of Mr. Kenyatta’s visit, that the “Future of the Northern Frontier District remains one for the final settlement by her Majesty’s government”. Mr. Kenyatta knew the Mogadishu government didn’t listen to his speech and were still confident that the African history and destiny can be decided by her Majesty’s government in England. Abdirahman Ahmed Shunuf is a former professor at Portland University in Oregon, USA and former Vice-Chancellor of University of Hargeisa.